the 2012 DCI World Championship in Indianapolis. The entire DCI community was saddened to learn this week of the sudden passing of Glenn E. Opie, 87, director of the Argonne Rebels Drum and Bugle Corps from 1949 through 1973. He was responsible for the Rebels becoming one of the original 13 founding members of DCI in 1972 and is a 2003 inductee into the DCI Hall of Fame. Opie took over the corps just a year after it was formed in 1948, and under his leadership, the Great Bend, Kansas corps became one of the top groups in American Legion and VFW competition, winning 13 Kansas State American Legion Championships and three American Legion National titles, among many other titles. The corps was a finalist in DCI's first two seasons and placed 5th at the first DCI World Championship in 1971. The quality of the corps' horn line, taught by longtime DCI judge and 1995 DCI Hall of Fame inductee Sandra Opie—Glenn's wife—was an inspiration to many fans and brass instructors alike. Opie was a veteran of the U.S. Navy and a worked as a lawyer in Great Bend since 1956. His impact on the community and the state was such that former Kansas U.S. Senator Robert Dole backed his nomination to the DCI Hall of Fame with the following personal letter: "It would be easy to say that [Argonne's] focus was on winning championships, but Glenn believed that quality of their young people was a far greater indication of their accomplishment than trophies and awards. From their ranks have come successful artists, musicians, educators, attorneys, doctors, engineers and business leaders. In Glenn's tenure, 1,700 young people passed through the organization, and all of them have been touched and affected in some way by Glenn's leadership and guidance. He taught all of them that there is no easy way, that 'Qui vincet debet pugnare' (He who would conquer must fight) was not just Argonne's motto; it is a way of life." Jeff Yeager, a member of Argonne Rebels from 1967 through 1974, had this to say about his mentor: "As I reflect back, it is hard to grasp the impact that Glenn had on so many. His positive influence on the lives of former Argonne members, the community of Great Bend and the drum corps activity will span multiple generations. Whether it was kids from dysfunctional homes, youth who needed help with the legal system, or students who sought assistance getting into college, Glenn was always there to help. He was a surrogate father to many. It was always about life lessons and values. There is a huge void right now in Central Kansas." Lively and active into his later years, all one needs to do to see that is watch this video from a 2009 Northwestern University Alumni Marching Band performance, when Opie helped lead the band onto the field 60 years after serving as Northwestern's drum major. 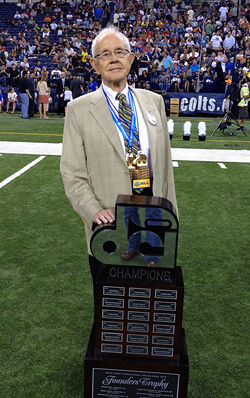 Opie was also on hand at the 2012 DCI World Championships in Indianapolis, as the surviving founding directors of Drum Corps International were honored and recognized during DCI's 40th anniversary season. His name, along with that of the Argonne Rebels, are commemorated on the newly renamed Founders Trophy, which is awarded each summer to the World Champion corps. Funeral services will be held on Friday, Aug. 16 at First United Methodist Church in Great Bend, Kansas. Visitation will take place Thursday, Aug. 15 at Bryant Funeral Home. Memorials are requested to the Glenn Opie Memorial Fund, in care of Bryant Funeral Home. Read Glenn Opie's obituary and funeral details. A profile of DCI Hall of Famer Glenn Opie Three World Championship awards bear new names Photo courtesy Jeff Yeager.